CSC DAYTONA TRIKE It’s a fact. Harley Davidson owners demand the ultimate in style and performance and accept nothing less in the equipment they ride. 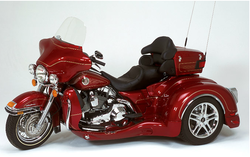 CSC Trike recognized that when we designed the Daytona trike conversion kit. The suspension is the result of superb performance engineering and innovation. A race-inspired, opposing rocker, mono-shock independent suspension design with Vertical Stablizer™ technology delivers ultimate handling and cornering ability. Trust us, with our Daytona trike conversion, your two-wheeled companions will be struggling to keep up with you on the twisties! The drive-train is a marvel of engineering excellence. Purpose built sprockets and a twin belt drive retain the stock gear ratio. The belts are a proprietary material and design, manufactured by Gates, the industry leader in belt technology and production. Twin-piston disc brake calipers are standard equipment, providing excellent stopping power under all conditions. Check out the optional Performance Brake Upgrade, a drilled rotor with nickel plating and a super-slick billet aluminum caliper.A meticulously styled body with our custom-designed LED tombstone taillights will turn heads wherever you may roam. And with our internally mounted Space Saver hinge design and over 6 cubic feet of trunk storage capacity, there's not much you'll ever have to leave behind.